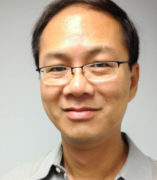 Mark Chiang holds a joint appointment in English and Asian American Studies. He is the author of The Cultural Capital of Asian American Studies: Autonomy and Representation in the University (NYU Press, 2009), which examines how institutional contexts shaped the development of the academic field of Asian American Studies in general, and of the Asian American literary and cultural field in particular. His current research focuses on intersections of the cultural and economic fields, as these are alternatively construed in the sociological and anthropological traditions, and how they can help to illuminate the intertwining dynamics of race and class in Asian American literary production, as well as the role of cultural production in current struggles over economic relations. Prof. Chiang formerly served as the founding director of the Asian American Studies Program at UIC. He teaches courses in Asian American literature and culture, multiethnic 20th century American literature, film, and cultural theory.